As real estate investment is increasingly integrated into the national and international economies, real estate and mortgage markets are facing dramatic change. 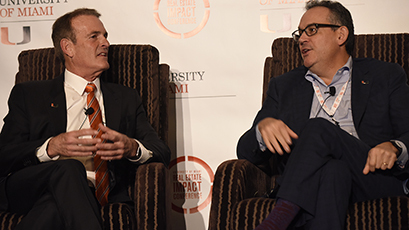 The University of Miami Business School is committed to helping individuals and organizations respond to that change. 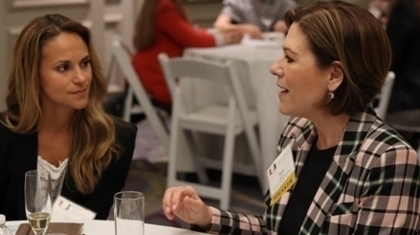 The School delivers innovative academic programs in real estate; conducts research that measures current trends and predicts future activity; and engages the business community in dialogue on the business of real estate. 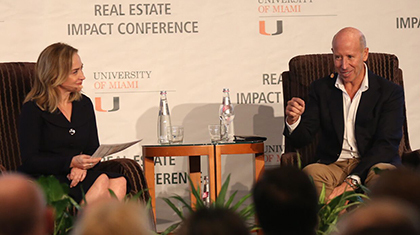 The real estate programs at the UM School of Business build on a world-class faculty, the New Urbanism program at the UM School of Architecture, and our ties to the local real estate market - an important component of the South Florida economy. Miami Business School offers an Accelerated MBA in Real Estate program, which is completed within 18 months. The program is highlighted by a six-month paid real estate industry internship prior to first semester, a summer real estate industry internship between first and second semester classes, and a consulting project with a real estate industry non-profit organization. As part of the School's traditional two-year MBA program, the School offers an MBA with real estate elective courses for students interested in pursuing leadership roles within the real estate industry. Courses are offered in real estate law, real estate finance, real estate investment and appraisal, and project management and development. Students may also take courses offered in the University's School of Architecture as part of their elective options. 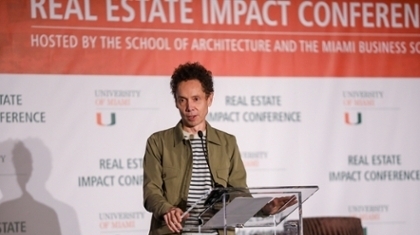 Miami Business School, in partnership with the University’s School of Architecture – an international leader in livable community design that has been ranked No. 1 in the nation by New Urban News – offers a joint Bachelor of Architecture/MBA program. This program allows students to earn a Bachelor of Architecture as well as a Master of Business Administration. The joint degree program offers students the unique opportunity to complete the two degrees in six years, saving an entire year by combining the programs. The multidisciplinary Master in Real Estate Development and Urbanism program brings together the strengths of the University’s School of Architecture, Business School and School of Law. The one-year graduate program combines the fundamentals of real estate development with livable community planning and design. Courses include real estate finance, market analysis, real estate law, land use policies and codes, construction and project management, public-private partnerships, sustainable development and entrepreneurship, among others. 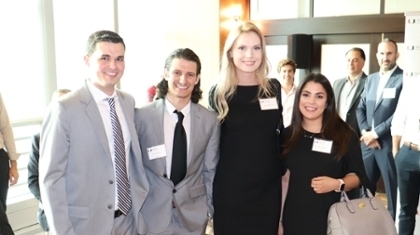 Miami Business School offers an undergraduate real estate major designed for students who want to apply theoretical and analytical concepts to real estate lending, investment and development. The program builds on real estate development and new urbanism concepts, while maintaining a strong emphasis on quantitative methods in finance. Courses are offered in such areas as investment and security markets, fixed income markets and analysis, real estate investment and appraisal, real estate finance, real estate law, real estate development and new urbanism. For more information about the graduate and undergraduate real estate programs, please contact Andrea Heuson, director of real estate programs, at aheuson@miami.edu or 305-284-1866.